It’s good to be back in the West. The short jaunt north from Colorado Springs to Denver, with the Rockies looming to the left reminded me that the flat Midwest and the modest (typographically speaking) East are, for the time being, in the past. 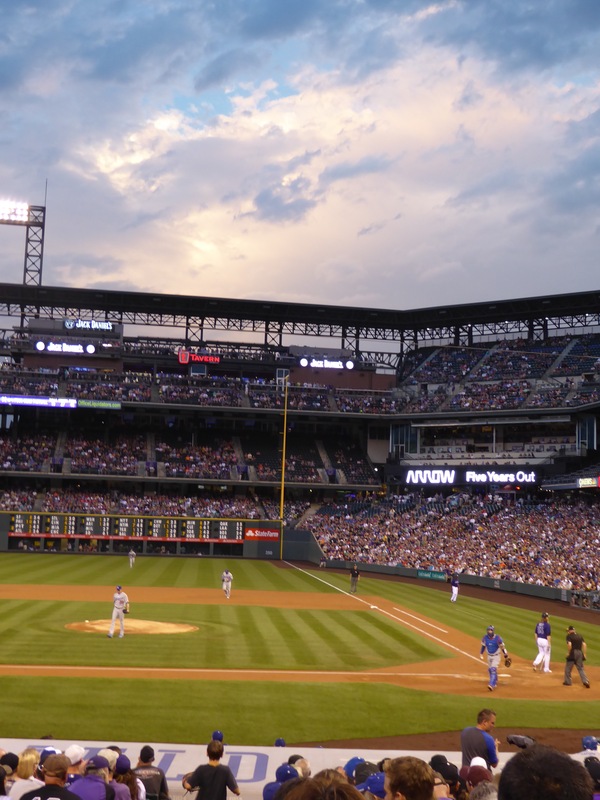 Like the Brewers, the Colorado Rockies play in a stadium named after a beer company – Coors Field. 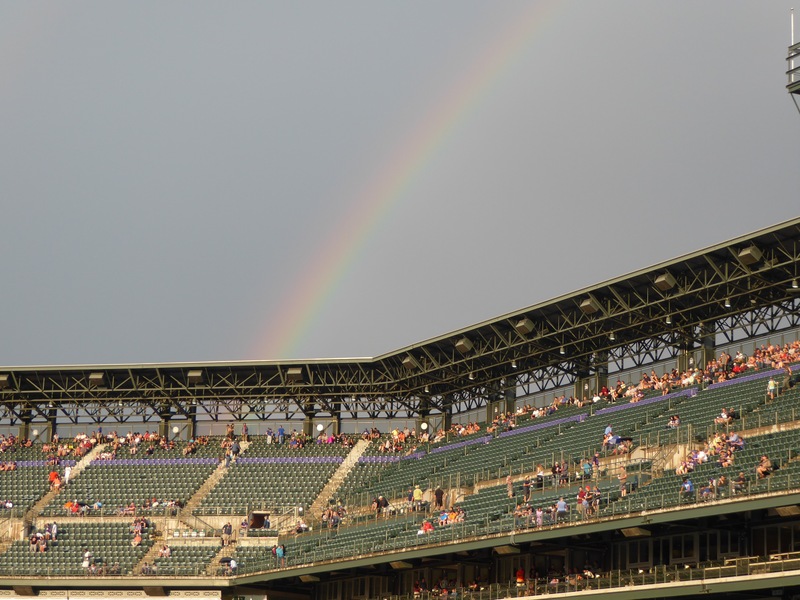 It is the highest (elevation) park in the majors, but is a come down from the Sky Sox home. It is the biggest on my itinerary as well, with a seating capacity over 50,000. 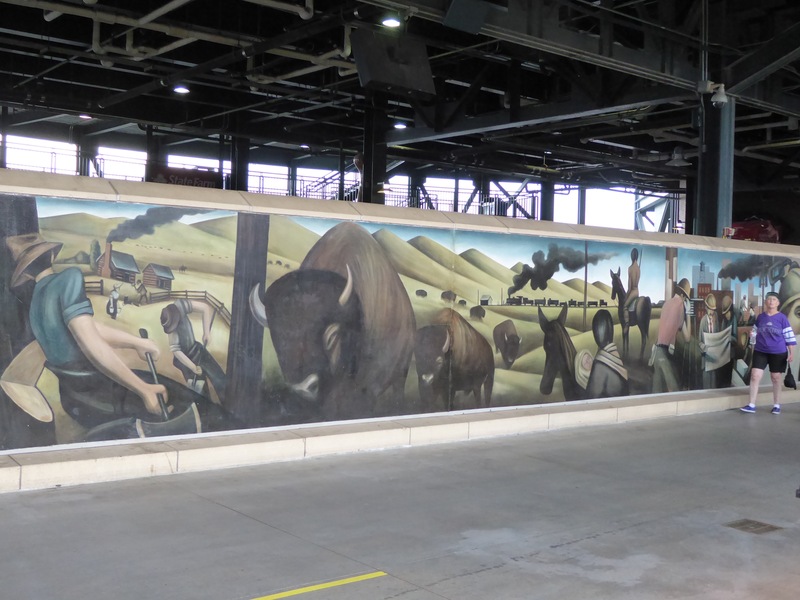 It also has a feature I saw in no other park – a large mural in the outfield concourse depicting scenes of Colorado. The Rockies took on the Dodgers, and I was fortunate to get a seat just above the Dodgers dugout and thus was able to get some looks at batters after they struck out. 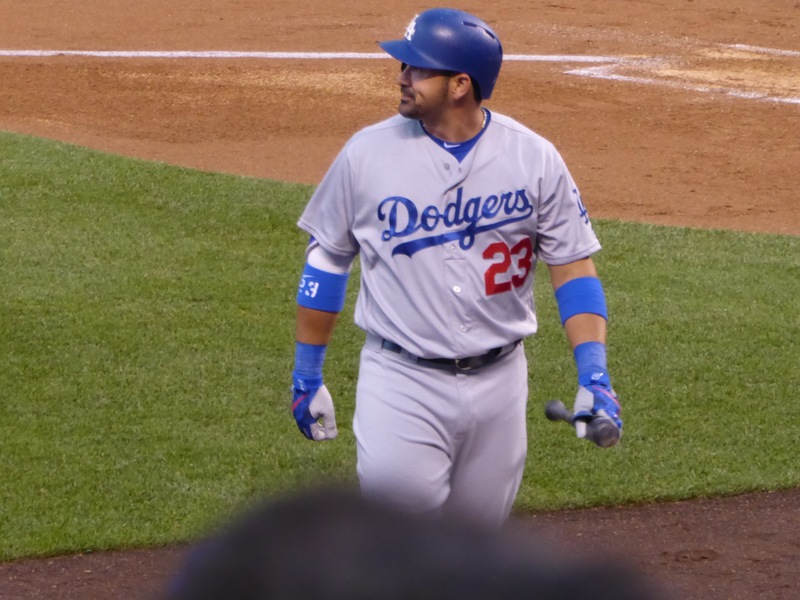 Adrian Gonzalez was typical, though rookie phenom Corey Seager (Kyle’s all-star brother) managed the feat three times – a golden sombrero as it is known. But all that happened (well, most of it) after a 45 minute rain delay beginning in the bottom of the first. It had rained briefly about an hour before game time and there were fears that this second shower would finish the game. 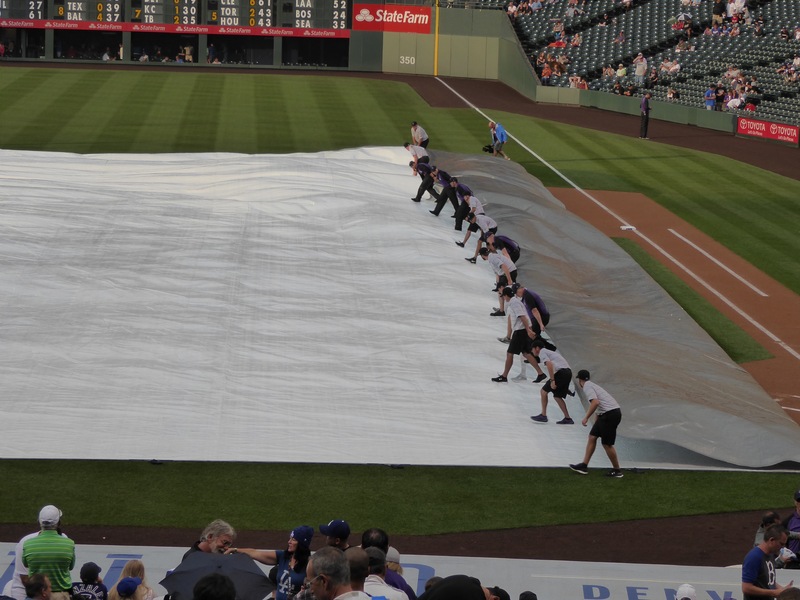 It didn’t and the groundskeepers once again worked their magic, rolling out and then rolling up the tarp. though it can lead to spectacular vistas as the clouds recede. There was some good, strategic pitching in this game and fewer home runs (only one) than in most I’ve seen. The Rockies won, 7-3 to wrap up my baseball adventure. Then there’s the food. Coors Field seems to have greater variety than any park I’ve visited, though there is less novelty. There’s a salad bar, one selling a selection of roasted nuts, deli sandwiches, gelato, frozen yogurt and gluten free offerings. My polish dog was ordinary and I frankly look forward to at least a few weeks without a hot dog in my diet. I have two days of hard driving ahead of me, so I won’t be posting until I can do a wrap up sometime this weekend. Thank you for your support through your generous comments and emails. I hope you have enjoyed the trip – I certainly have. Hard to believe it’s all over but trucker miles. Probably seems like half an eon to you at this point. Again, it’s all been enjoyable about which to hear, while stuck on the 23rd floor. I’d like to suggest you take the rest of the week off, although we look forward to your return.